This may sound like the first page from a catalogue of wall-paper for posh homes, but it is a quote from Matisse. Few artists can be trusted when they talk about their art. Instead of saying, “I am better at expressing myself through brush and paints than talking”, they often dismiss any question with, “I was just doodling” or “I see it that way”. Both answers are never true. If they were indeed seeing it “that way”, their attempts at walking across the road would rarely be successful. If they were just “doodling”, they wouldn’t bother to frame and exhibit the result. Fortunately, Matisse was as good with words, as with his colours. He indeed wanted to create art that could provide a peaceful and harmonious retreat to the observer. When ill health prevented Matisse from painting (he was around 70 at the time), he invented a new artistic medium: coloured paper. His assistants would paint sheets of paper with gouache, and he would then cut into it with tailor’s scissors, directing his staff to apply his cut-outs onto paper, canvas, or directly onto walls of his studio. He was suffering from immobility and pain, but an observer who is not aware of the sad circumstances of his life would never suspect anything was wrong looking at his colourful artworks. 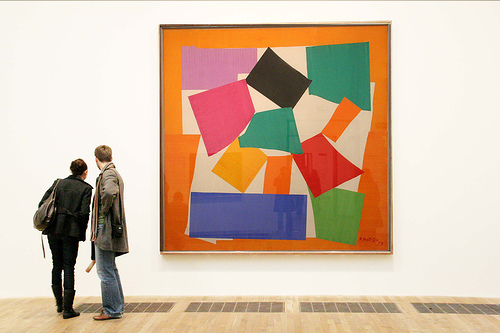 Matisse’s cut-outs, especially large ones, are examples of the worlds he created for himself, his clients, and the “mentally-working” public, in general. My sympathies go out to the working class, but Matisse realised a stonemason needed a physical couch to provide relaxation more than a mental one. He also understood that the average stonemason wouldn’t have the money to buy even an unsigned copy of his work. These large-scale “worlds” are built almost exclusively from natural shapes and forms: algae, flowers, leaves, fish, and birds. And then, in his final year he created two very unusual works: Memory of Oceania and The Snail. 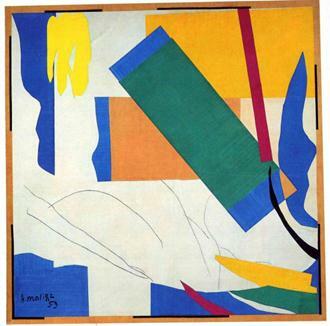 Memory of Oceania was based on Matisse’s memories of a boat trip to Tahiti, and included both rectangular and natural forms, along with sketchy lines that are believed to reflect Matisse’s recollections of the waves in the wake of the boat. Art historians still argue about the meaning of different shapes here. If the clash of rectangular forms with natural shapes was unusual, The Snail was beyond anything that could be expected from Matisse. 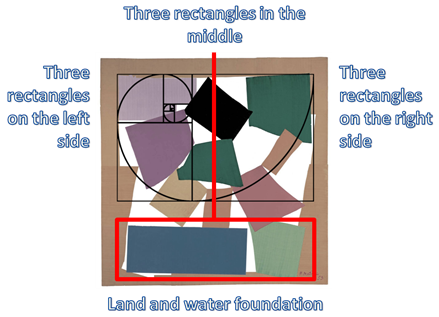 Why would Matisse create something like The Snail out of unnatural rectangles piled up on each other within a somewhat jagged frame, with only the work’s title able to hint at a spiral? He changed the title himself when he completed the work: from The Snail to Chromatic Composition. It shows an obvious intent to steer observers away from the more obvious associations. Why would Matisse create a large work that would be so different to everything he was doing before? It is known that he saw The Snail as one of his most important artworks. It is also known he spent a lot of time arranging and rearranging the pieces. Because he didn’t have time to accomplish his mission. He couldn’t create individual “chairs” or “life boats” for everyone. He left The Snail, as a construction set for the observer to build his own perfect retreat, or for other artists to use it as a well for their own inspiration. Matisse gives the observer the original coloured paper to play with. The rectangular shapes (that are sometimes just torn by his hand, rough hewn) are offered for you to cut: “sculpt” whatever way you may fancy. 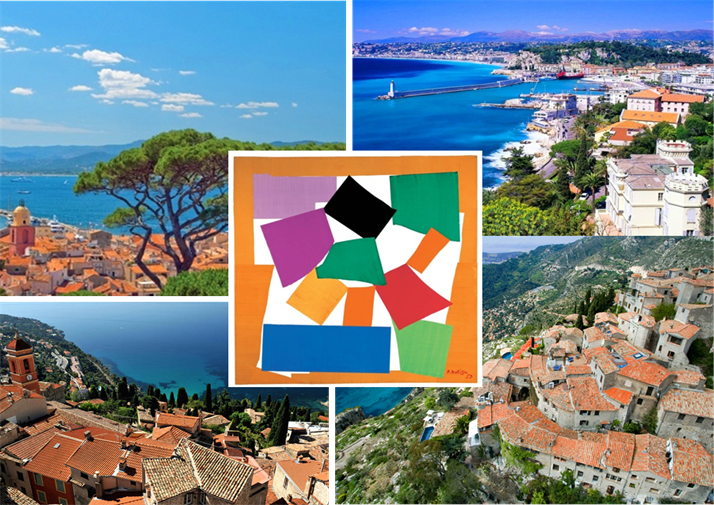 Matisse sets out the rules of colour harmony. And indeed, in an average Mediterranean view, you’d get two or three pairs of complimentary colours, which our brain interprets as representative of natural harmony. Matisse sets out the rules of compositional harmony. Compositional harmony is about the equilibrium, the movement, and the rhythm in an artwork. The snail is a synonym of harmony because its shell is based on the Golden Ratio. The snail carries its home on itself, it is self-sufficient, and does not think twice before crawling away on an adventure. 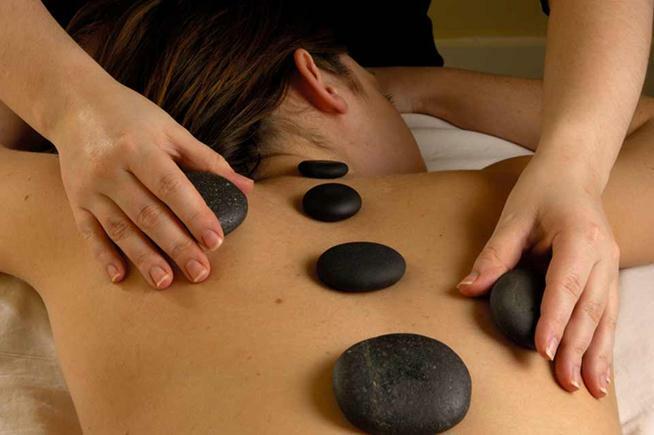 A harmonious retreat should be similarly self-sufficient. I’ve introduced a spiral that is a common visualization for the Golden Ratio in the Snail. You can see that the rectangles fit nicely into it, with the top one just sitting comfy there, in its golden-rationed corner. The Golden Ratio, also called the Divine Proportion, is important here not just because it helps to create a nice balance. Our Universe is constructed according to golden-ratio rules. As you, the observer, are about to begin your own creation process, Matisse provides you with the main principle by which to do it. If we draw a vertical line in the middle, we’ll see that three rectangles are on the right, three on the left and another three sit on the vertical line, creating a perfect balance. Now you can realize how surprised I was to read that Tate curators saw people dancing in The Snail. The way Matisse organized the composition does not support this claim. Why did Matisse confine his rectangles in an orange coloured frame? A good retreat must have boundaries, which prevent good things on the inside from getting out and bad things on the outside from falling in. It must be a closed ecosystem, self-sufficient like a snail. Why is the boundary orange in colour? It is solid terracotta material that can hold things together without creating the impression of a prison. We wouldn’t want the wall of our retreat to be totally impregnable (like, dull brown, or sizzlingly hot red, or black iron), we want them warm and friendly to us and to our theoretically possible guests. Matisse offers the observer to play god (not become one). 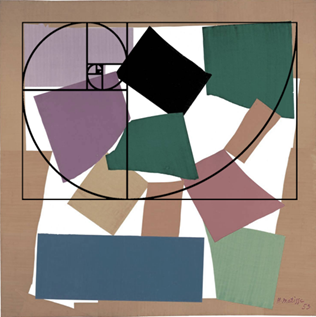 Why did Matisse include black and leave white in The Snail? Because black is the sum of all colours and white is the absence of colour, if you think of colour as a pigment. If you think of colour as a wave-length, black and white switch places. Matisse wants to guide the observer in his or her creative efforts, but he doesn’t want to confine them to a few predefined colours or shapes. They can extract whatever they want from black or white. The black square is cut almost in half by the red vertical line. Its right half is slightly bigger, but that is done because there is a deep blue slab at the bottom, so the black is tipped slightly to the right to counter-weight the blue. The area of white colour is also equal on the right and on the left. 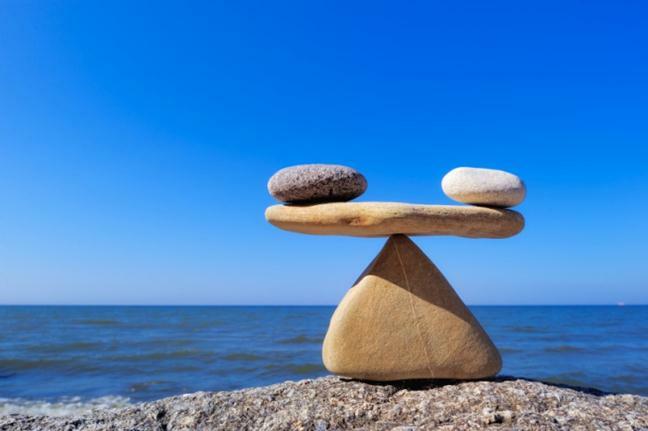 That anchors the overall balance as well. Matisse wanted retreats that you’d create to be a moral sanctuary as well. For Matisse, who rediscovered religion by the end of his life, a harmonious retreat was impossible without it being a moral sanctuary as well. There are 11 rectangles, each of them very individual, that are in harmony with each other surrounded by a frame that holds them all. Or is it Christ leading his 11 good apostles? We can’t know for sure, but some see religious symbolism here. In The Snail, Matisse handed down to the observer everything he thought he had learned about colour, composition, harmony, life, the universe and everything. 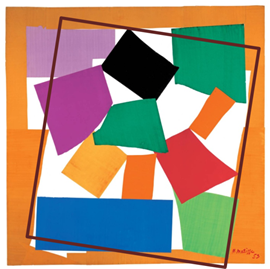 It is one of the greatest, but at the same time one of the most complicated works by Matisse. It is easy to enjoy his Icarus. It takes a lot of effort to appreciate The Snail. Yet, the rewards of understanding The Snail can be wondrous: your own world of harmony and love. You just have to build it. PS I am aware my posts are tagged by ads at the bottom. I can’t see the actual ads, just a space informing me that they are there. I guess now is the right time for a Cote d’Azure real estate agency to have something there, and learn the benefits of being relevant. I, personally, after playing with the Snail for a few hours, can’t wait until I get to the world of these colours. To sample this blog, click on About at the top. It has links to some of my best or typical posts. There’s an Art & Fun shelf if you feel like in need of a laugh. This entry was posted in Art and tagged Abstract Art, Art history, Inspiration, Matisse, Modern art, Photography, Tate Modern on June 1, 2014 by artmoscow. Finally able to begin reading the blogs and, even though I felt pretty competent about Matisse and art History, I have learned a great deal and have new ideas to think about. Like many, I have been too easy in not paying enough attention to the cut-out period in his life, focusing, like most on his earlier years. Thak you K for this. And now on to reading the others. It seems there is a great deal to catch up on!! A really interesting and thought provoking post. Thanks! I will be following closely. Matisse is my favourite artist followed by Paul Klee. I remember over 20 years ago going to Nice, France and seeing some of his work. The Open Window has always been a favourite of mine. Those colours … Mmmm. I really enjoyed your insights and the multiple post treatment for The Snail. It was an intellectual and visual treat absorbing the images with your excellent analysis and insight. I loved the fact you included people and benches with the image examples. The monumental scale is such an overwhelming aspect when seen in person. Thank you! Yes, size does matter when it comes to Matisse… Yesterday, I was sitting in front of his wall-to-wall Dance at the Hermitage in St.Petersburg, feeling like I have an endless world to explore. Wow, I’d love to see that in person. Thank you! ) 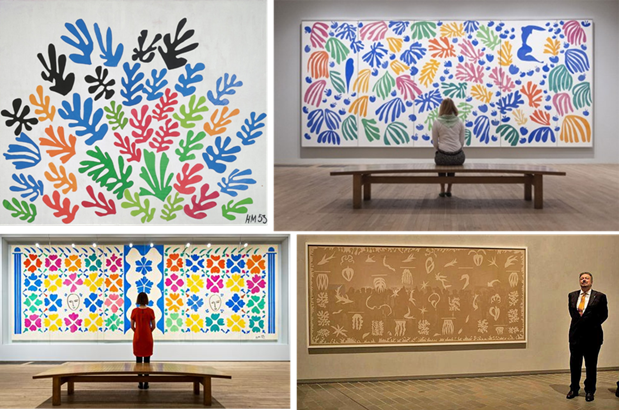 If their resulting inspirations makes them create any work of art based on this post and Matisse – please, please let me know! Thank you my friend for revealing a lot that has passed me by. Now you have me blushing ) Thank you!